« TSMC May Still Become Apple's Main A9 Chip Supplier? 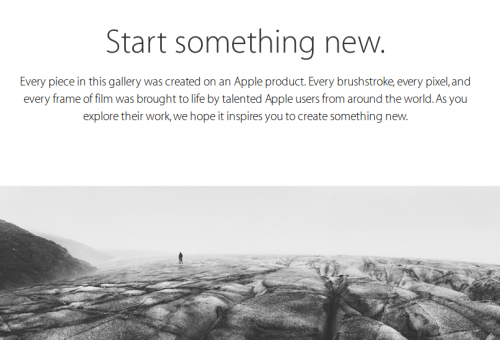 As you probably know, back in December, Apple launched its Start Something New campaign in Japan. The aim of this campaign is to show works of art users can create with the help of Apple’s Macs, iPhones and iPads and such products as VSCO Cam, Brushes, Slow Shutter, iDraw, Waterlogue, iMovie, Procreate and Final Cut Pro. Looks like the guys from Cupertino have decided to expand their new art campaign worldwide as now it can be found on Apple websites across the globe. In particular, the new section of the website was spotted by the users in the USA, Europe and Asia. If you want to take a look at the images and videos created with the help of Apple gadgets, you may visit the Start Something New website right now. What do you think about the pieces of art found on the website? Leave your comments below.